I’ve been following the Mordheim Facebook group for a while, waiting until I can start playing again. I found this great summary of thoughts from a developer on what he thinks he did right and wrong with creating the rules for Mordheim, and it’s fantastic! After a productive rummage through the city, it was time to head back to their temporary den. The Skaven warband “Fierce” was scurrying back through the city as a good pace. The six rats easily moved through the shadows without making a noise. Even the large rat ogre, Stinky, had no trouble sticking to the darkness as shadows grew longer. Cheesey the Assassin Adept came to a silent hault, and the warband froze. From the distance came the loud bellowing of the quarreling green-skin warband. The dumb brutes were walking in their direction. Cheesey saw that they were both heading down the same street, with only one way to get to the other side; by slicing through the thick sculls of the Orc warband. Cheesey almost squealed in delight of the thought of sinking his fighting claws into the Orcs who had forced him to retreat. 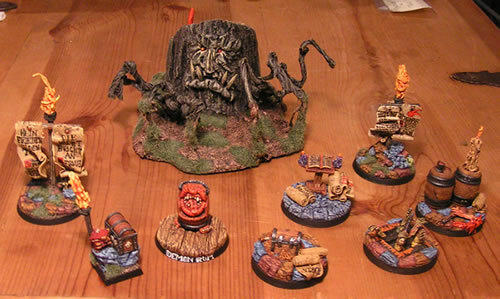 What I’m trying to say is that, although it pains me to admit it, I am officially on a Mordheim break. I hope to get back on top of my other projects in the near future. Feel free to browse through my previous posts until I get back to Mordheim. Over the last 4 years, I have become quite a blogging fanatic, and even though this is the smallest niche of my blogs (besides my family blog) it is by far the most popular. Thank you for visiting, reading and commenting.